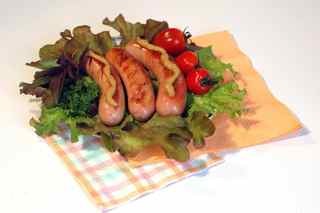 ...The Germans have been making "wurst" for centuries and many of the world's most popular sausage making recipes today are for traditional German varieties. Wurst is the German word for sausage, and it is often used as part of the name of the specific sausage recipe. Example--weisswurst means "white sausage". German sausages can also get their names from the their place of origin. Braunschweiger (a smoked liver sausage) is associated with Braunschweig (Brunswick) in Saxony, and it's not hard for us to guess where the name frankfurter came from. German wursts are often at their best when served with a traditional side dish of sauerkraut. Another great compliment is any of a wide range of mustards, from spicy and coarse to sweet and hot.